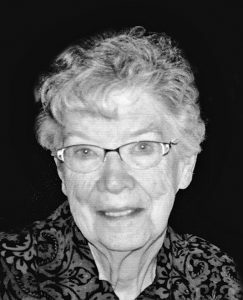 Luella “Lolly” May Thomas, 90, of Forestburg, died Saturday, March 30, 2019, at Avera Brady Health and Rehab. Funeral services will be at 2 p.m. on Saturday, April 13, at the Mitchell Wesleyan Church under the direction of the Bittner Funeral Chapel. Visitation will be held on Friday, April 12, 5-7 p.m. at Bittner Funeral Chapel. Burial will be in the Bonney Cemetery in Floyd Township, Sanborn County. Luella May Connor was born April 30, 1928, in Albion, Mich., to Earl E. and Ruth (Rhodes) Connor. She attended elementary school there and graduated from Albion High School in 1945. After two years in nearby Spring Arbor College (now University), she graduated in 1951 from Greenville College (now University) with a degree in elementary education. Shortly after graduation, she returned to Michigan to marry Warren Thomas whom she had met during her senior year. The couple moved to Mitchell, where she was employed in the office of the public school on East Fifth Street. Her husband began his second teaching year at Longfellow Elementary when he was drafted into the army during the Korean War. During his year in the artillery in Korea, she lived with her sister-in-law, Ramona Thomas, in Seattle, Wash., teaching in E. C. Hughes Elementary in West Seattle. Upon Warren’s return in 1953, they both taught in West Seattle before returning to his parents’ farm in Sanborn County in 1954. They lived in Floyd Township for 65 years prior to her death. In 1955, Kevin Reed was born, followed by Lyndon Brent in 1959. After their sons were of school age, Lolly returned to teaching, first in Forestburg Elementary, and then, for 23 years, she was a lower elementary teacher in Artesian. She retired in 1993. Home, community and Mitchell Wesleyan Church activities occupied her volunteering time in later years. Lolly was church organist for some 20 years and gave piano lessons for neighborhood children. Luella is survived by her husband, Warren; sons, Kevin (Selena) and Lyndon (Kathy); four sisters, Dorothy (Robert) Smith of Decatur, Ill., Eleanor (Bill) Moore of Springfield, Mo., Marti (John) Oakley of Concord, Mich., and Katy (Stan) Chwatun of Jackson, Mich.; as well as grandchildren, cousins, nieces and nephews.